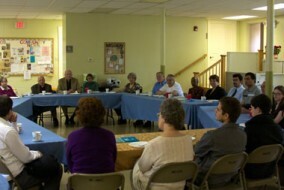 May 6th 2012, The Whitehouse United Methodist Church in Whitehouse, NJ hosted the Peace Islands Institute in a Friendship Gathering. Mrs. Fatma Bakir, a PII representative, spoke about PII and its programs. She spoke about friendship gatherings because of its influence and great impact on mutual understanding that builds long-lasting friendship. PII volunteers from the area brought the homemade traditional refreshments with them that everyone enjoyed very much. We thank Rev. Karen Singara for making this event possible.